Cat Eyed Boy is a half-human, half-monster child whose mostly human appearance bans him from the demon world. He lives hidden in the shadows of the human world, hated by humans and demons alike. Wherever he goes, awful events occur as the humans and demons interact. In stories of revenge and retribution full of disturbing images, Cat Eyed Boy acts as a trickster, saving the innocent and helping the wicked receive the punishment that fate metes out. Nekome Kozou was published in English as Cat Eyed Boy by VIZ Media in 2 volumes under the VIZ Signature imprint on June 17, 2008. A live-action film adaptation of the series was released in Japan on June 10, 2006. I have to say that it was a struggle to complete this manga, but I did so just because it was so short. I'd say that it nails the horror element. This is an older manga and the visuals interested me as they are pretty grotesque and it does well in the element of shock value. The art style to me doesn't scream the typical "anime style", and in fact a lot of it reminds me of the western style, which isn't a bad thing, just something to note due to it's age. The main character, the Cat Eyed Boy, is interesting, as he comes across as somewhat of an anti-hero. He isn't fully human, but does have human-like characteristics. Throughout each tale, he is seen as a "bad omen", as all of the horrors happen wherever he happens to go. He often acts on self-interest, but does intervene from time to time to help someone in need. He also isn't afraid to retaliate either, though. The series in my opinion is very over-dramatised, as there are pretty much shock bubbles on every page, and the stories to me get a bit predictable. I like the horror element but I tend to prefer series that have more subtle climb to the climax of the story while in Cat Eyed Boy, things are made pretty obvious. There are some good messages within this manga. It's filled with monsters and strange creatures and some of them are evil, but in certain cases this manga reflects on the shallow nature that much of society has on judging people based on appearances, when the "beautiful" people are in fact much more ugly on the inside. Overall, the series is short and dated, it has great horror visuals but I wasn't really drawn to the series and it in fact was quite boring and predictable for me. In some respects it can be sexist with an old-timey attitude which doesn't age well, and the story wasn't something that drew me in. It's a great visual experience if you're into horror, and that would be the highlight of the series for me. Let&rsquo;s face it; there aren&rsquo;t very many horror mangas out here in America that are scary. The only truly scary ones are Uzumaki and The Drifting Classroom, but that is my opinion. 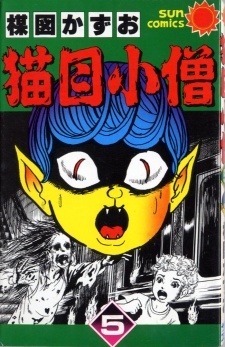 Viz Signature line has recently brought forth to America a brand new series by Kazuo Umezu (The creator behind The Drifting Classroom) called Cat Eyed Boy. Will this be the new horror series that will actually scare us? Let me put it this way. Cat Eyed Boy is kind of like Mushishi. Like Mushishi, the series centers around one character, which is Cat Eyed Boy for this story. Just like Mushishi, the entire series is a collection of short or sometimes long stories that happen to Cat Eyed Boy or the people he runs into. The stories themselves are quite interesting, exciting, and sometimes freaky. Examples of these are The Band of 100 Monsters, The Immortal Man, and The Promise. Other stories, aren&rsquo;t really interesting and just not plain scary, like The Ugly Demon. Overall, since this series is a bunch of mini stories combined into two volumes, I&rsquo;m sure you&rsquo;ll find at least one story you&rsquo;ll like. Well&hellip; this comic was made back in the 60s from what I&rsquo;ve heard and it sure shows. The art looks very old school and the basic layout of the panels is also very old school. However, this art is rather impressive. The world the characters all live in very detailed, the characters are drawn very nice and look more realistic compared to most manga characters today, and the monsters themselves are often freaky and scary to look at. Still, a lot of the human characters often look very cartoonish and take away from the fright level of many of the stories. A lot of the demons themselves look weird and often don&rsquo;t provide any chills. There is only one main character and the rest are just characters that appear only once for one story. Cat Eyed Boy himself&hellip; or itself is an unique character. He sides with no one most often and is often a spectator to the situation, but he often lends a helping hand to humans or demons, despite getting no thanks at all for his work. He also likes causing mischief and sometimes likes to harass humans for fun as well. So, he is a good guy often and sometimes a bad guy depending on the situation. As for the rest, there is no one else really to mention. Like I said before, the series only has one character and everyone else is a one time appearance. The one timers for most stories are interesting for the most part, such as Kodomo from The Band of 100 Demons and The Monster Professor from The Ugly Demon. Still, a lot of these characters are not appealing and you will not miss them at all after the story has passed. Well, since I&rsquo;m a fan of Kazuo Umezu, I picked up this series in hopes of finding a brand new good story to read. Overall, it was a good choice. If you enjoy Kazuo Umezu and his works, you&rsquo;ll probably want to get this story. If you also enjoy horror mangas, you&rsquo;ll probably like this one as well. Everyone else will probably want to look away from this series and even some horror fans might want to avoid this series since it often does not provide many horror thrills. Like I said before, fans of horror and Kazuo Umezu will enjoy this series, while other might steer clear of Cat Eyed Boy. The series provides some great horror stories that are freaky enough and will make your heart race as you read. I highly recommend you read one of the stories from the series first before you buy it, just so you know what you are getting yourself into. This series contains blood and gore, strong violence, some violence against children, and a lot of disturbing images. If you are not into this stuff, avoid this series or view at your own risk. He's no man, he's no cat, he's Cat Eyed Boy! A young boy with feline features and supernatural dispositions, carrying his bindle across Japan, irresistibly drawn to places where mystery lingers and horrible tragedies are about to strike. Viz published his adventures in two larges volumes in 2006. As observant readers may guess from the fine realistic graphic style, this work by horror manga master Kazuo Umezu is actually from a much earlier period. It was originally serialized in Shonen Gahosha, Shonen King and Shonen Sunday from 1967 to the year after, preceding well-known classics such as The Drifting Classroom and Orochi. The eleven stories that make up the books are very uneven in length, some span only a few tens of pages, others one or two hundred. There's also a central story much longer than the others that connect the two volumes; it's the Band of One-Hundred Monsters, where Cat Eyed Boy tries to defeat the nasty three-eyed dwarf Kodomo and his hideous minions. In his first adventure, The Immortal Man, Cat Eyed Boy's role seems more that of a witness. But it is in truth misguiding as he takes an active part in all the following stories, often changing the course of events or solving the mystery himself. In the tradition of Japanese horror, the basis for the story is often set in a - presumably fictitious - legend, be it monsters roaming deep forests or statues protecting villages. There's a strong cultural theme in several of the plots and this alone should rejoice fans of Asian horror. The way it is told, however, is not so satisfying. Some stories, especially the central one, seems to drag on needlessly. It's all about showing monsters and scary scenes and oftentimes the narrative seems to be used as a piece of canvas, stretched in loose ends to fit whatever Umezu wants to draw. The writing is especially weak, although it is hard to tell who is to blame, Umezu or the translator. Viz usually provides good translations but that one seemed below their usual standard. Take the title for instance, where's the hyphen between "cat" and "eyed"? After the train wreck in The Meat Ball Monster, a sentence caught my attention, too, because it made no sense in the context and not much on its own, either: "And in the present day - the national railway frequently raised fares. And railway accidents occured frequently." There's a lot of tepid, uninspired dialogues, pointless exclamations and one-liners of bewildering blandness. But Umezu is fore and foremost a graphic artist, and in that department he delivers with the ease of a true master. Each story abounds of ugly monsters and twisted human faces looking at them in utter horror. There's a good deal of blood, too, although some stories are more violent than others. But what remains afterwards is the intense imagery; many vignettes leave an imprint in the mind, fleeting nightmare visions of a black and white world. There's a few color panels in the second book, one page in full color with a dark haunting palette and others with monochromatic (green or red) tones that gives a really nice feel. Cat Eyed Boy may be not an essential read, but it's definitely worth a look! Umezu's vivid creativity and his eye for horror make up for the various shortcomings of the writing. Not to mention the titular character, whose quaint style and good-hearted devilishness are the right traits for a companion on this macabre journey.